IPL at home – does it live up to the hype? Late last year after doing a wedding for a bride who had flown over from Thailand and extolled the benefits of IPL hair removal, I decided to bite the bullet and see for myself whether the financially crippling treatment really lives up to the hype. I have waxed my legs and bikini area for about 12 years now but have continued to shave my underarms simply because I didn’t want to wait for at least 5mm of growth before waxing. With dark hair though, the constant shaving had left me with a permanent and unsightly shadow under my arms which I absolutely hated. At £40 a session (and that is at the inexpensive end of the IPL spectrum), I shelled out for six sessions which left my underarm hair reduced by about 50% – pretty good, but for £240 I wasn’t ecstatic. 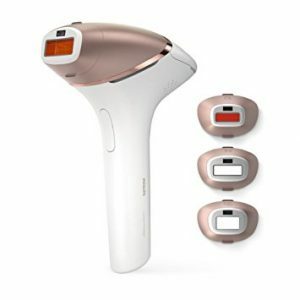 And that’s when I read about the Philips Lumea Prestige home IPL machine. The suggested retail price is an eyewatering £575 (though I paid £320 from www.allbeauty.com) but I reasoned with my current waxing and IPL monthly sessions costing me £80, I would soon recoup the costs… if it worked. For those of you who are not au fait with IPL, or Intense Pulsed Light, hair removal, a wavelength is emitted into the skin and is absorbed by the pigment in the hair (which should be shaved prior to the treatment to avoid any singeing (!) and maximise the effectiveness of the light). This light quickly turns to heat which kills the growing cells that make the hair. Because it targets pigment, IPL works best on those with fair skin and dark hair and should not be used by those with dark skin as it can cause scarring. The Philips Lumea Prestige comes with four attachments which are shaped for the different parts of your body – the largest attachment is for areas of your body such as legs, stomach and back (not my back but I did use it on my husband in this area! ), while other attachments are for the bikini area, underarms and face. When you switch it on, you hold it over an area of your skin which it scans to tell you the correct level to use it at from 1-5. You can also download an app which reminds you of when to use the Lumea (biweekly for the first 8 weeks to catch all of the hairs in their different growing cycles) and from then on every 4-6 weeks or as required. I have heard many people say that IPL is like being flicked with a rubber band. I would concur with this – it is like very short flashes of heat hitting your skin but isn’t painful. I have now been using my Lumea for about 10 weeks. My underarms have responded brilliantly with only a tiny patch of regrowth under my right arm which I’ll continue to target biweekly. When I last examined my legs after two weeks I found a grand total of 5 hairs on one of my lower legs and my thighs are pretty hair free too, though the hair is lighter in colour there so the IPL is naturally less effective. Surprisingly for me, my bikini area has been the most stubborn, even though it is the area that I have waxed the longest. However, I have noticed roughly a 60% reduction in hair growth which is pretty good. I’m going to continue the biweekly treatments in that area and see how it goes over the next few months. And for those of you who are interested, my husband’s back is completely hair free after just two sessions so he is really pleased! Overall I am absolutely thrilled with the results of my Philips Lumea Prestige and I only wish I had known about IPL years ago. Yes, it’s a big initial outlay, but only four months of waxing and underarm IPL would have cost the same as the machine and for a full course of IPL on underarms, legs and bikini line, I would have been looking at well over £3000 so the figures definitely add up.